New Zealand has made its most famous film-maker a knight in the reinstatement of the title for the first time in a decade. 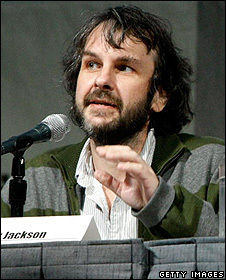 Peter Jackson, maker of the Oscar-winning Lord of the Rings trilogy, said the award was "better than the Oscars". Former Prime Minister Helen Clark, who had abolished British knighthoods in 2000, was made a member of the Order of New Zealand. This is the highest honour available in the country. It carries no honorific and is limited to 20 living New Zealanders at any one time. Ms Clark, who now heads the United Nations Development Programme, said she "certainly would not" have accepted a damehood, but felt privileged to receive the honour. Sir Peter's Lord of the Rings trilogy won a total of 17 Oscars, and earned him the home-grown title of Companion of the New Zealand Order of Merit in 2002. In a written statement, Jackson described the honour as an "incredible moment." "I didn't think anything would surpass the 2004 Academy Awards, but I was wrong," he said. "The feeling of gratitude and pride I have in accepting this honour from my home country is profound." Sir Peter was made a Companion of the New Zealand Order of Merit in 2002, and has "continued to excel in and significantly contribute to the New Zealand film industry", the citation for his knighthood reads. The New Zealand Herald newspaper reported that Sir Peter was in New Zealand this month for the premiere of his latest movie, The Lovely Bones. He remembers the early days: "When I was growing up in Pukerua Bay I spent weekends shooting war movies in my parents' vegetable garden with their Super-8 camera. I was eight years old and had no real expectation of being a film director. My dream was to work on special effects. "One of the best things about growing up in New Zealand is that if you are prepared to work hard and have faith in yourself, truly anything is possible." The newspaper added that Sir Peter financially supports local schools, film and arts festivals and the GiveLife New Zealand Organ Donation Awareness Charity. The awards were among 193 given to those active in sports, the arts, charity and even theology.